Detta är ett zoom-objektiv som tillverkats av Sigma och modellen lanserades 2012. Om du köper detta objektiv följer det med ett motljusskydd, vars modellbeteckning är "LH680-01". Text från Sigma: "This 11.1x high zoom ratio lens incorporates Sigma’s original OS function and offers a broad shooting range from wide angle to telephoto. The latest optical technology enables easy handheld photography with a compact construction and length of just 87.7mm, making it ideal for various scenes such as landscape, sport and general photography. The compact construction guarantees excellent mobility making ideal for travel photography. FLD (“F” Low Dispersion) glass, which has performance equal to fluorite, SLD (Special Low Dispersion) glass elements, and aspherical lens elements provide high image quality throughout the entire zoom range. Sigma’s HSM (Hyper Sonic Motor) ensures fast and quiet auto-focusing. 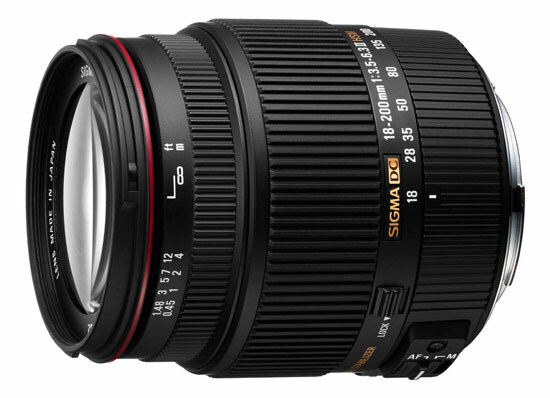 The Sigma 18-200mm F3.5-6.3 II DC OS HSM is the successor to the SIGMA 18-200mm F3.5-6.3 DC OS/ HSM which was launched in June 2007. This lens features the latest optical technology including FLD glass elements and aspherical lens elements, making it compact with a length of just 87.7mm whilst keeping high rendering performance. This compact construction guarantees excellent mobility with superior image quality. One FLD (“F” Low Dispersion) glass element, which has performance equal to fluorite, and two SLD (Special Low Dispersion) glass elements provide excellent correction for colour aberrations. Two glass mould aspherical and one hybrid aspherical lens elements ensure excellent correction for all types of aberrations. Together they provide a high level of optical performance throughout the entire zoom range. *FLD glass is the highest level low dispersion glass available with extremely high light transmission. This optical glass has a performance equal to fluorite glass which has a low refractive index and low dispersion compared to current optical glass. It also benefits from high anomalous dispersion. These characteristics give excellent correction for residual chromatic aberration (secondary spectrum) which cannot be corrected by ordinary optical glass and ensures high definition and high contrast images. Sigma’s Super Multi-Layer Coating reduces flare and ghosting as well as providing sharp and high contrast images throughout the entire zoom range. The OS system offers effective correction of approximately 4 stops, making it ideal for handheld photography of various scenes such as travel, general, and sport. * Sony and Pentax mounts do not incorporate optical stabilisation. For Pentax mount, auto focus will not be available on Pentax ist* series and K100D cameras. A magnification scale is displayed on the lens barrel. A zoom lock prevents the lens from creeping due to its own weight, and to offer protection whilst the lens is being carried. The inner focusing system eliminates front lens rotation, making the lens particularly suitable for using the supplied light-resistant petal-type hood and circular polarizing filters. The all new 18-200mm F3.5-6.3 II DC OS HSM lens is updated with FLD glass which have the performance equal to fluorite glass and SLD glass provides excellent correction of color aberration. Whether you’re a beginner or an experienced photographer, the Sigma 18-200mm F3.5-6.3 II DC OS HSM is an all purpose lens offers convenience and features on all levels. Its versatility allows the photographer to capture wide angle photos such as scenic, landscape or group photography and at the telephoto end is great for sports action. Portraits are also within these lenses capabilities. Compact and lightweight it’s easy to carry and it will always deliver amazing images."